Cornish Rex is one of the relatively recent domestic cat breeds. It originated in the mid of twentieth century in Cornwall United Kingdom when a very unique looking kitten was seen in a domestic cat litter. This baby was a result of genetic mutation and displayed a singular appearance. It had no outer hair and a different body type than other cats. The striking appearance aroused interest and breeding of this felid was started in earnest. Earlier efforts were not quite successful and it took some time before healthy cats with consistent attributes were seen regularly in litters. During their development, Cornish Rex cats were outcrossed with Siamese to give them the elegant body form they currently possess. Today they enjoy widespread recognition in most parts of the world. 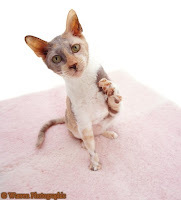 Cornish Rex cats have a very lithe yet muscular appearance. They may appear somewhat fragile owing to their slender, almost hairless, bodies but are in fact quite hard and strong in their physical make-up. Legs are long and finely built and enable the cat to produce great bursts of speed in no time. Head is small with prominent cheek bones and big ears. Coat is incredibly soft and made up entirely of down hair, or the undercoat. They are curly and smooth and shed very little, leading to fewer allergies for their owners. A number of coat colors and patterns are seen. Even as they are quite similar to the Devon Rex in appearance, there are certain differences between the two. 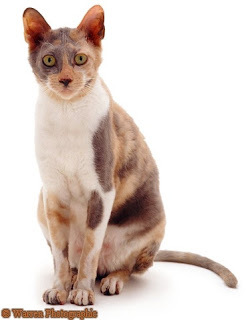 First is the mutant gene that leads to the characteristic appearance of the Cornish Rex - this differs from the mutated gene of the Devon Rex. Second the Devon Rex has the outer coat of guard hair that Cornish Rex cats lack. Still the Cornish Rex coat is denser. Also the facial appearance is a little different, with the Cornish sporting a distinct Roman nose in contrast to the Devon. 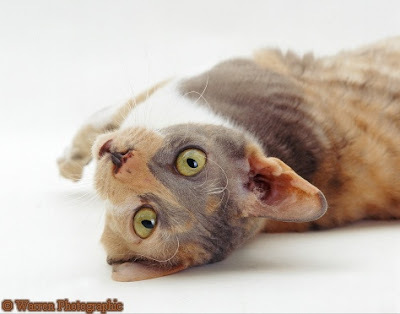 Cornish Rex have one of the best personalities of all feline breeds. They are very active and energetic and continue their playful behavior throughout their lives. Intelligent animals, they develop ingenious games for fun. Since they lack fur on the undersurface of their paws, they are able to grasp objects better than most felines. Lack of outer hair also means that the Cornish Rex are susceptible to cold and should be best keep indoor. Athletic and agile, these energetic cats are fast movers and good climbers. Their curiosity often leads them into unusual places in the house. For their ever pleasant and positive attitude towards life, the Cornish Rex are one of the best companions an ailurophile can have. Your thoughts are really motivating me to write my own blog soon about cat pets. I just love cats and they are really adorable. Would you pay people to write your essays for you? Please give me an idea. I think I have that kind of cat. Im just not sure but definitely looks similar in this pictures. This cat doesn't look as lovely as other cats but as a cat lover, I will still want to have one!